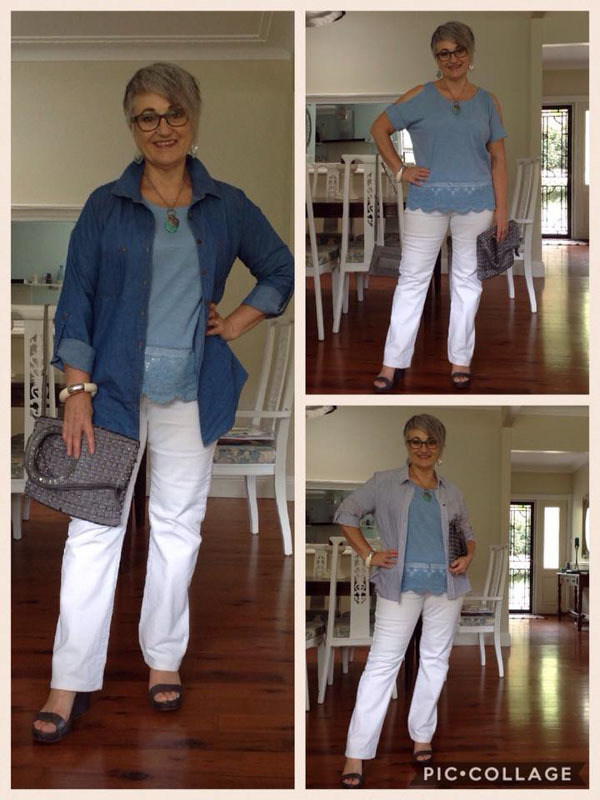 Deborah is one of the members of the 40+Style club and resides in Australia. 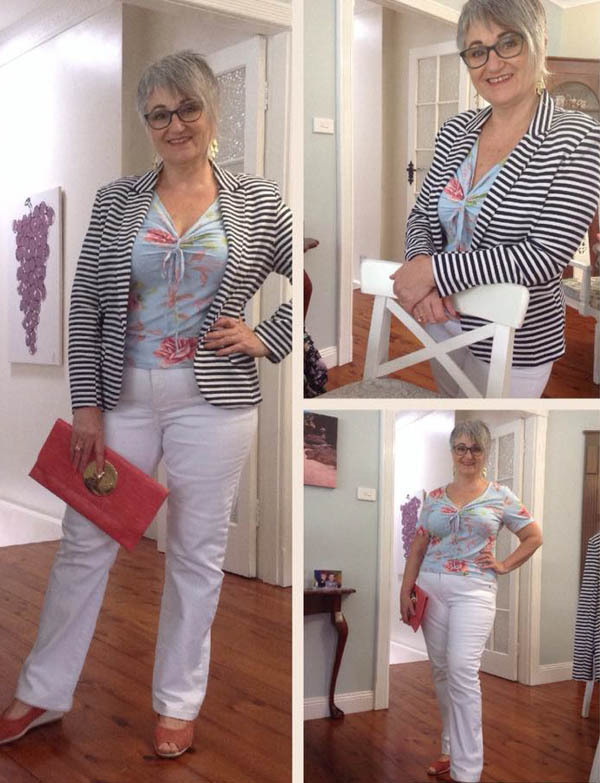 She has a fabulous and unique style where asymmetry and color play a key role so let’s discover her style secrets! 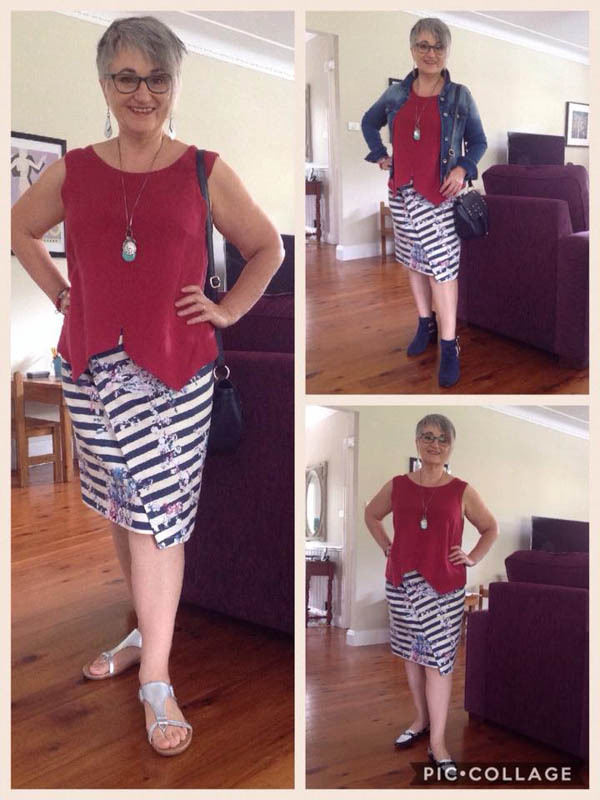 I’m a dressmaker working part time for myself at home, living in a city on the east coast of Australia. 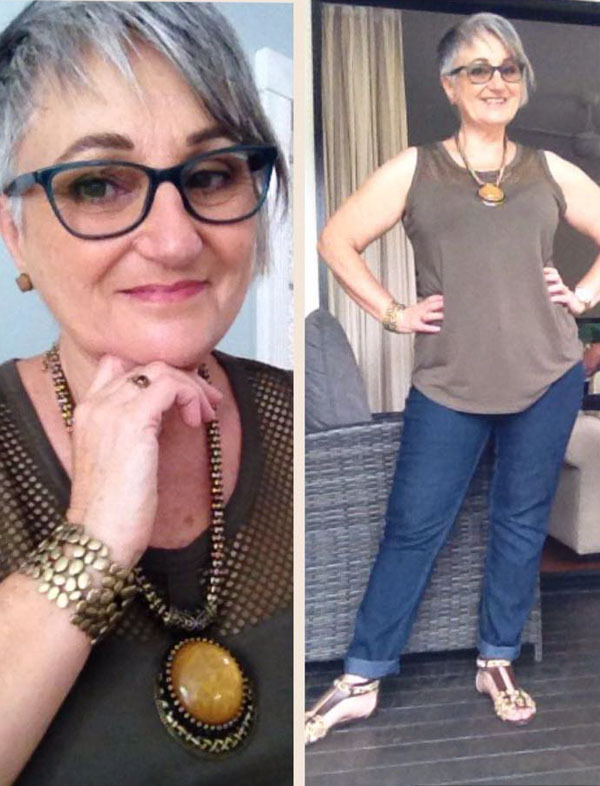 I’m 59, an empty nester, a grandmother, and loving this time of my life. 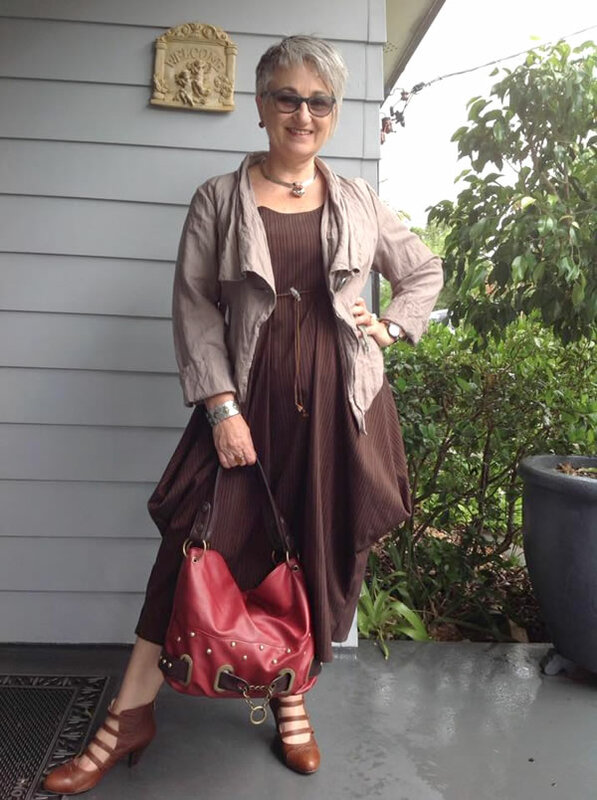 Can you tell us a bit more about why you joined the 40+ style club? I enjoy reading your blog and the style club started up at just the right time for me. 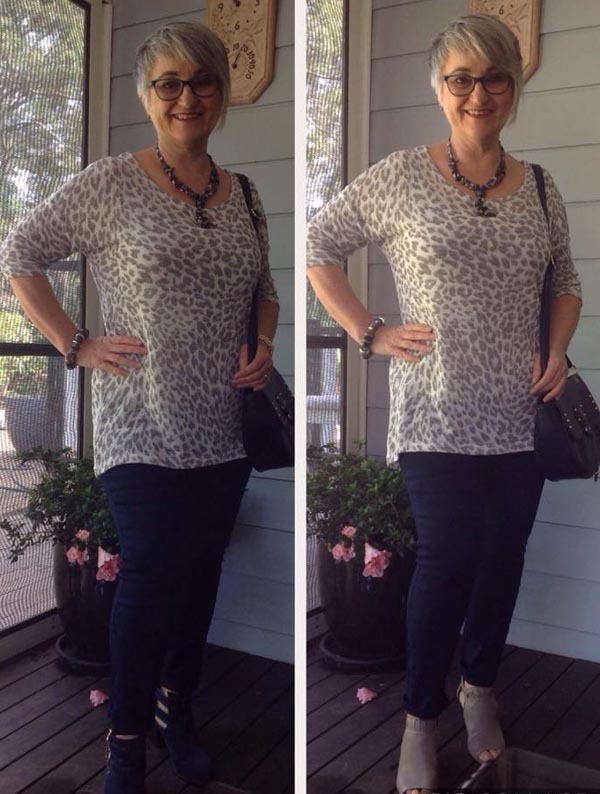 I had just put on a bit of weight, my clothes weren’t fitting and needed replacing. I was feeling despondent and uninspired. I needed some direction to uplift and motivate me. When I joined I found inspiration and motivation, I feel better about myself. I have accepted where my body is right now and am enjoying trying new styles and challenging myself to dress to express the inner me. I would say elegant chic with a dramatic edge. I like there to be something unique in an outfit, or some sense of drama. I love asymmetry, notice the hair! I like making a statement either with shape or colour, but not bold or loud. Newcastle on the east coast of Australia has a temperate climate with hot humid summers and mild winters. I need to wear natural fibres in summer for the humidity. My lifestyle is totally casual, even when I see clients at home I dress smart casual. Even going out I rarely require anything dressier. I rarely wear heels anymore. I love asymmetry. I also love layering and scarves and statement necklaces. My most common outfit would probably be styled around a pencil skirt and in winter with tights and flat boots. At the moment being winter here I am inspired by the colour combinations in my scarves. 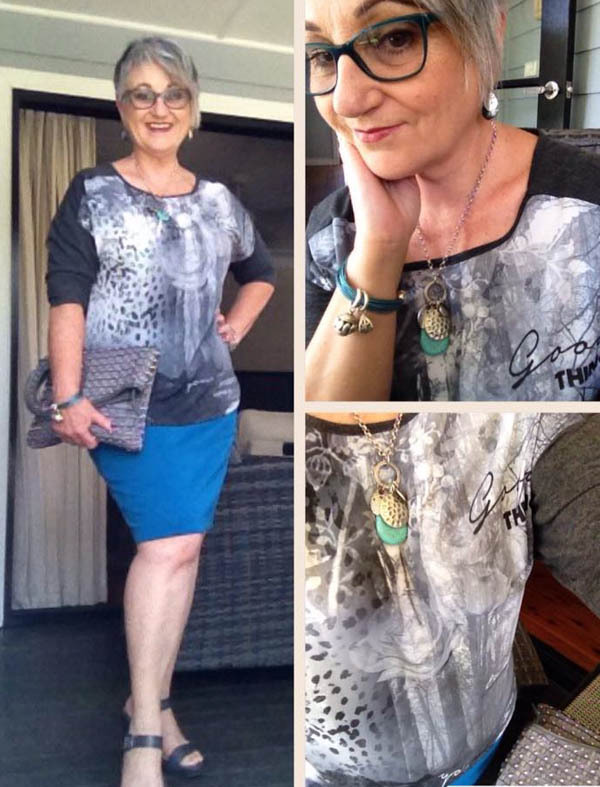 I am also inspired by fashion bloggers like yourself. Mostly I do, but I break the rules if a style suits my personality but not my figure. I have warm, medium light, muted colouring and stay true to these colours as best I can. I like to have a cohesive wardrobe with less clothes and more options and it is much easier to do this if the colours all go together. I am 5’0″ (153cm) tall. 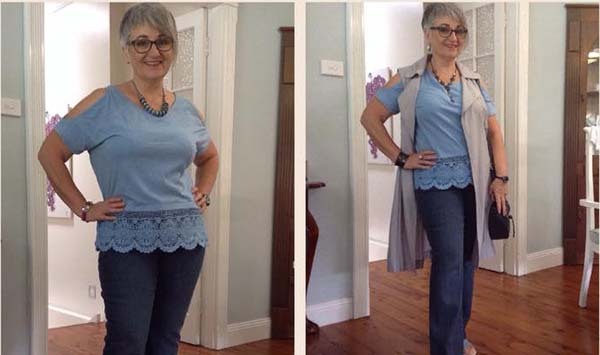 I am petite, so achieving good proportions in my outfits especially while wearing flat shoes is a challenge. I have an hourglass shape but my weight fluctuates and I’m probably more rectangle at the moment. 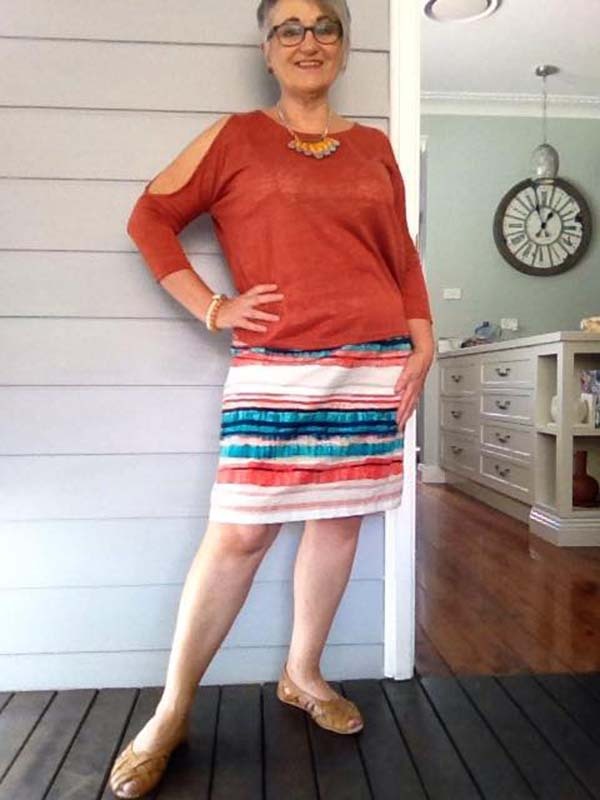 I love pencil skirts to show my shape, but I’m needing some flowy tops now to skim my belly. I like quality fabrics and clothes with unique styling . These types of clothing come with price tags out of my price range. Years ago this need drove me to shop in thrift stores. Nowadays I shop there by choice, there is always a treasure to be found. I don’t like our society’s throw- away attitudes to fast fashion. The majority of my clothes are thrifted with the occasional new piece or I might sew a unique item to meet my creative need. I am more confident and more accepting of my imperfections and that is reflected in the way I dress. 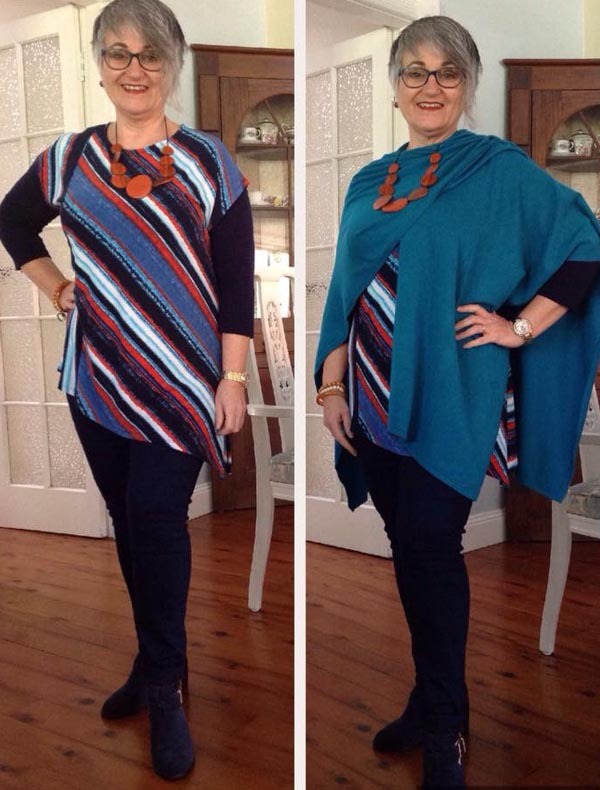 That confidence comes from knowing what styles work best for my shape and wearing the colours that I know suit me. I am learning how to express my personality through the clothes that I wear. I do follow trends but only buy something if I know it will suit me. I do look for trends when I’m thrift shopping. If i’m going to wear thrifted clothes and have grey hair, I have to make sure that I look current. 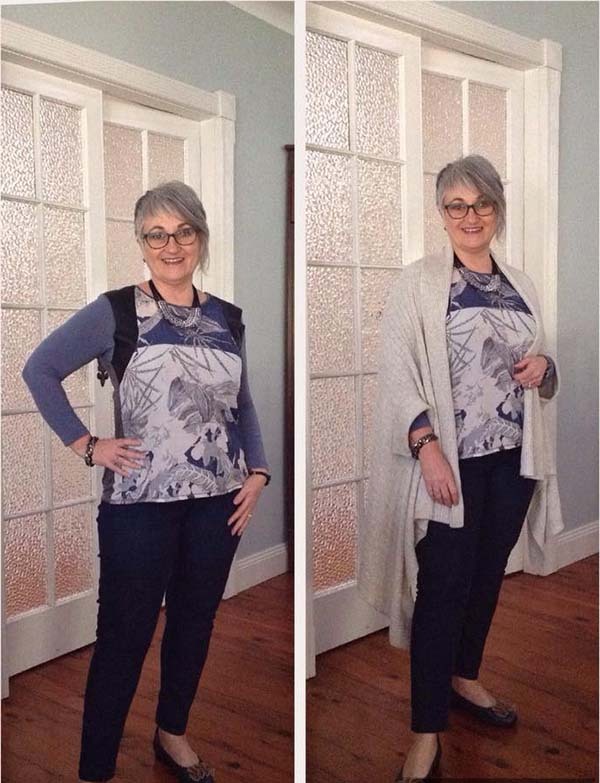 How has the style club helped you ignite your style? 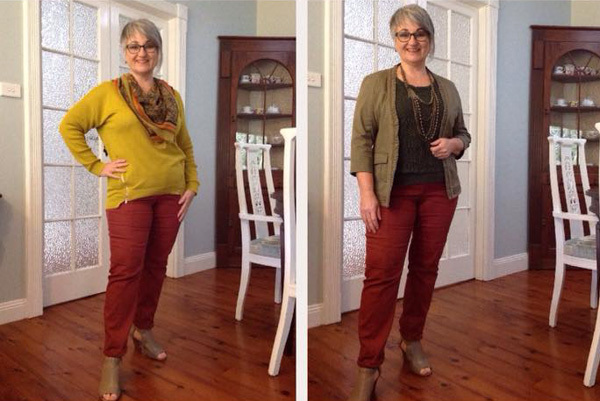 It’s given me back my confidence and motivates me to try new outfit combinations. I’m loving shopping my wardrobe. I love the variety, there’s a new challenge to look forward to each month. Thanks so much for this interview Deborah! Which of Deborah’s outfits is your favorite? P.S. 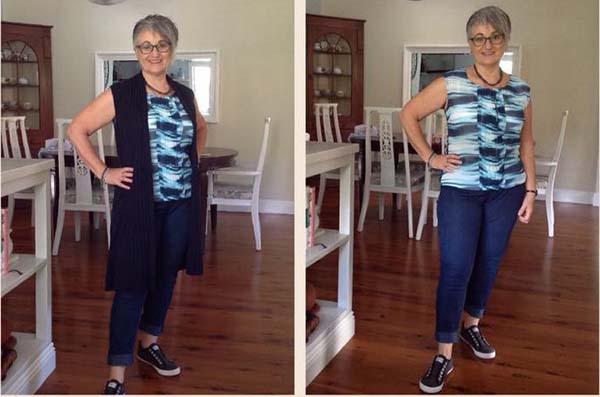 If you like to ignite your style and get monthly style training and style challenges, you may like to join the 40+Style Club! 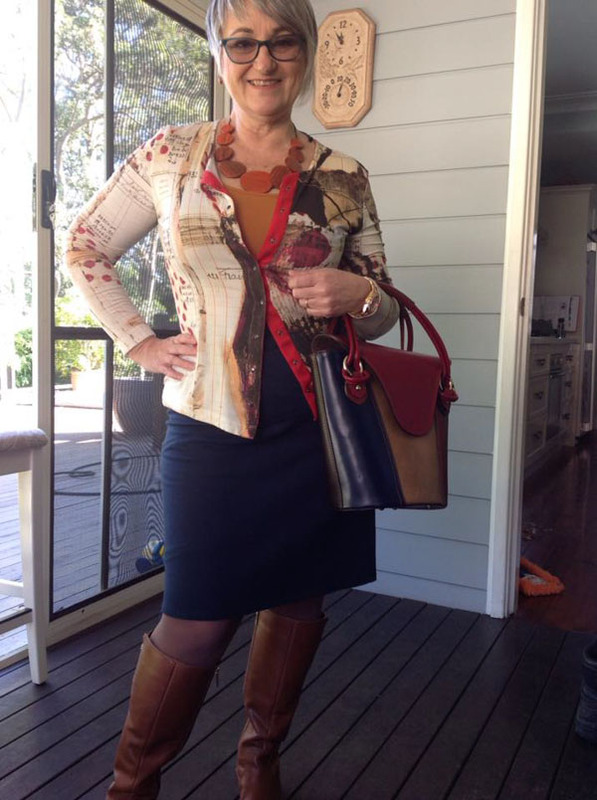 You will get to interact with Deborah and the many other women of the club in the private member community. The style theme for the coming month will be Color where we will share lots of detailed (video)training on how to discover your best colors. You can join and get instant access to all training and challenges here. Great interview with Deborah. She has amazing style and great colour sense. This woman is an inspiration. I want to know where she got her shoes! My favorite outfit is the asymmetrical striped top with the black leggings, black shoes, blue sweater, and red statement necklace. 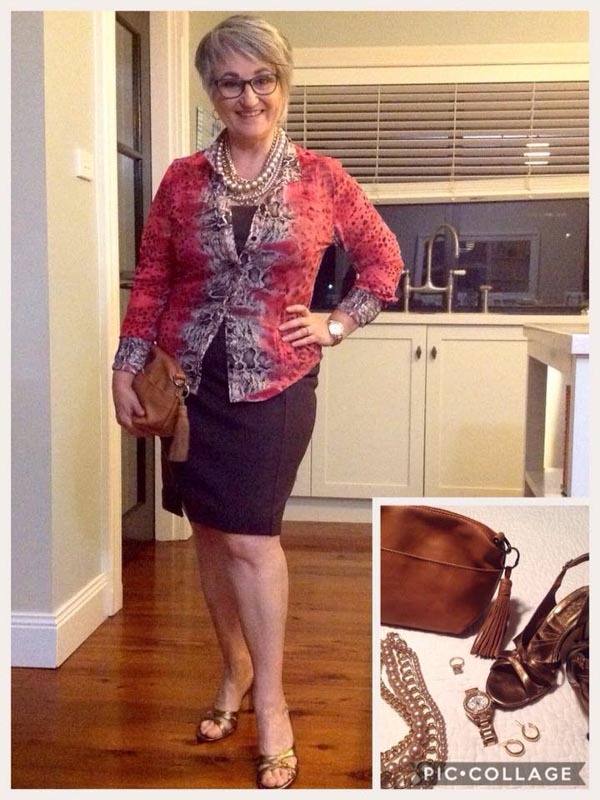 Fabulous interview with fellow style club member Deborah. 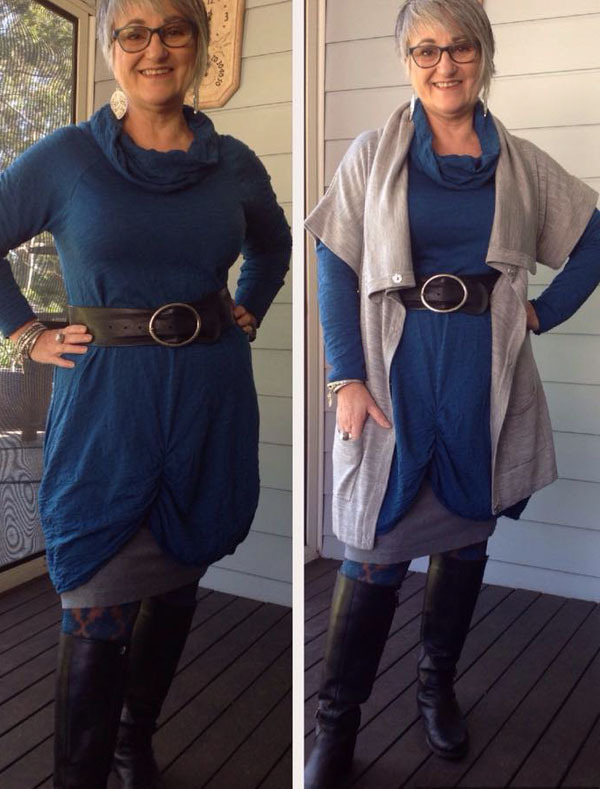 Seeing so many of her outfits in this post is truly inspiring. I always look forward to seeing what she does in the challenges. Deborah what a great interview congratulations. Love your haircut and unique outfits. 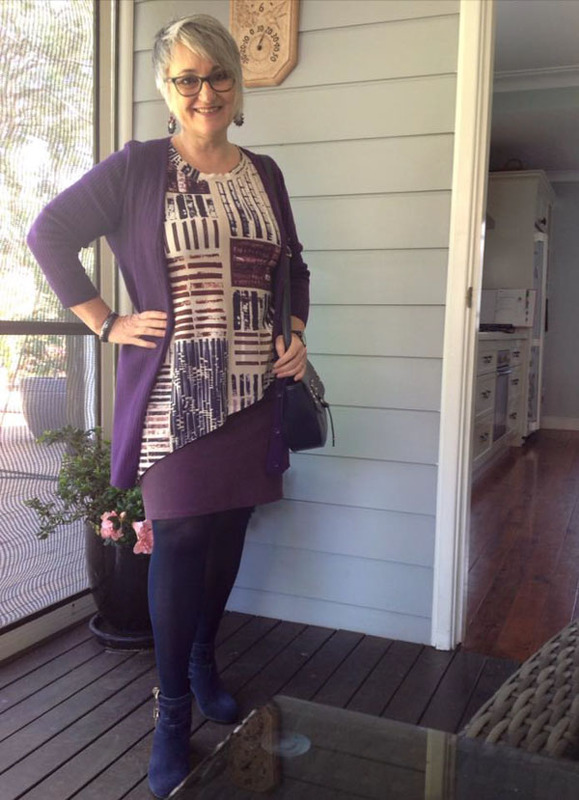 My favorite is the purple skirt and cardigan with print asymmetric top. 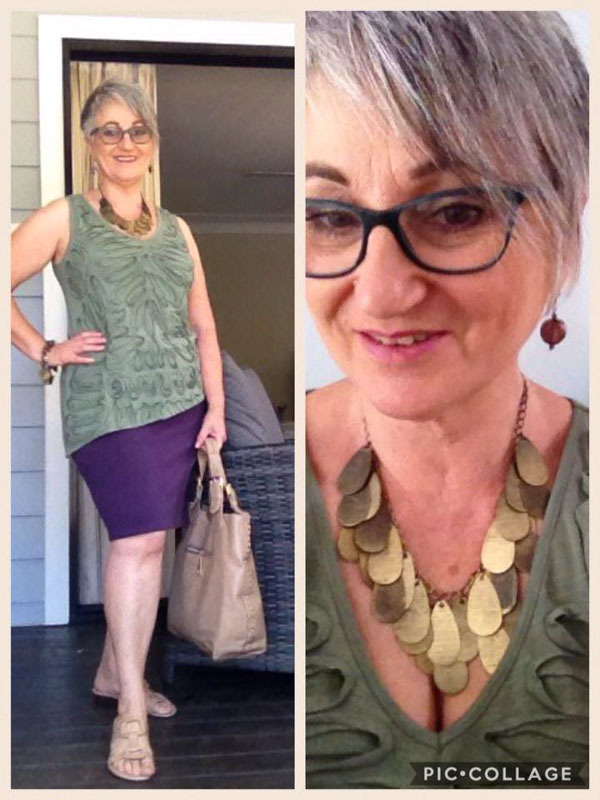 Also love the statement necklace over taupe tank and jeans. I’m 5 foot 0 too and you rock every inch! 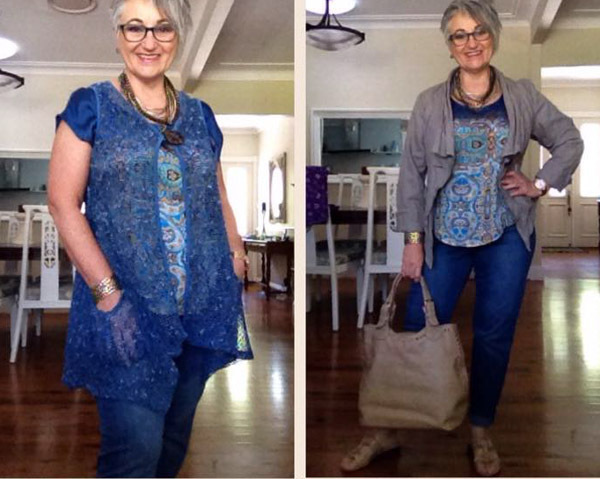 I’m so delighted that Deborah is also a thrifter! Shopping in a sustainable environmentally friendly manner is of utmost importance to me. Deborah shows how to do it well. What a great interview! 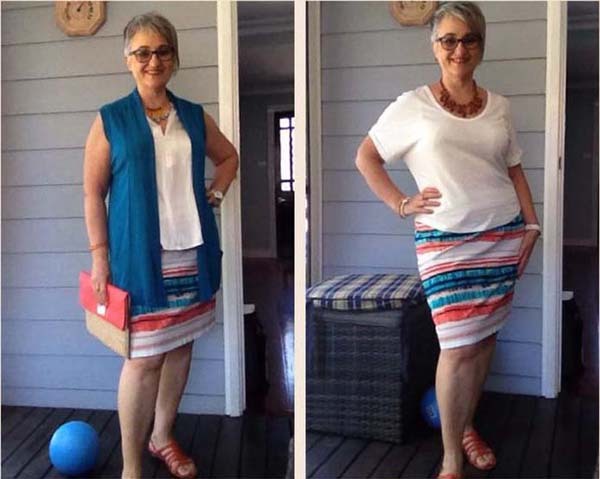 Deborah is such an inspiration within the style club. She always puts together unique color combinations. I want to try them for myself. It’s been lovely getting to know her and the other members of the style club. I grinned when I read: “I love asymmetry, notice the hair!”Right up your alley Sylvia. I love the outfit with the tapered blue skirt best. But that is just a matter of my personal preference. You look great Deborah. I’ll be re-creating this interview – I really like your style. You have a great figure!